Angela and David came to Lisa Stoner Events from New York. They met through their work; Angela is a professional A cappella singer and David is an entrepreneur and sound engineer. Angela seemed almost exasperated at a design meeting and was struggling to identify her wedding style. She exclaimed "I don't really know how to articulate what I want to see in the design of my wedding, all I know is that my favorite color is red and my favorite movie is 'Tangled!' "
You see, Angela has a legitimate (and relatable) obsession with Disney, and that was all I needed!!! I think we have our design elements, Rapunzel would be jealous. 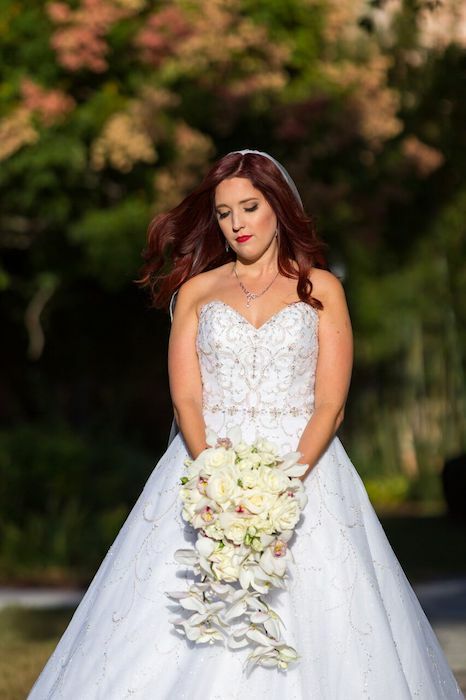 Angela chose a beautiful white satin gown with a sweetheart neckline and shimmering gold and crystal embellishments. 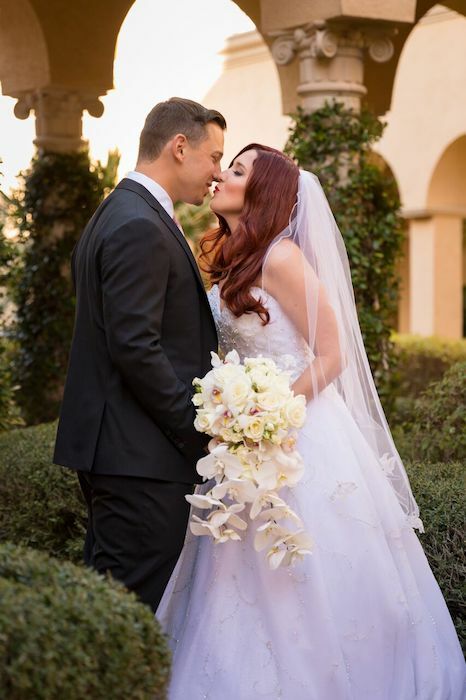 The gown was complimented by her full, cascading bridal bouquet of white roses, phalaenopsis and cymbidium orchids and a pop of color with her stunning red pumps. Her bridesmaids wore knee length red gowns paired with bright red bouquets to infuse more of the red into the design. 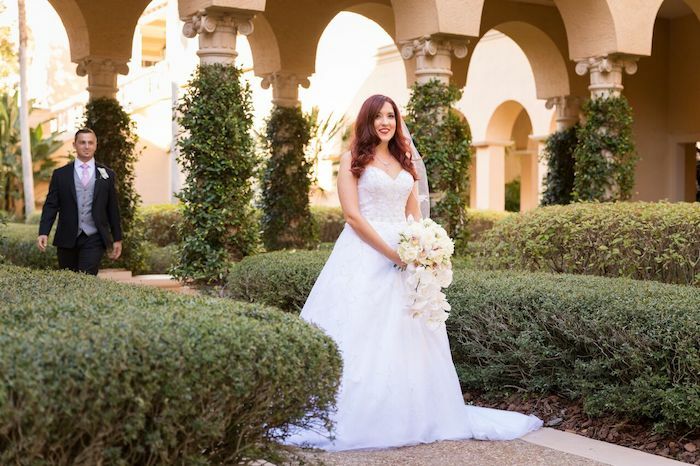 David and Angela enjoyed a First Look and some time alone in the beautiful Ritz Carlton gardens, before exchanging their vows. As the wedding ceremony began David waited for Angela’s arrival with an ear to ear smile on his face. 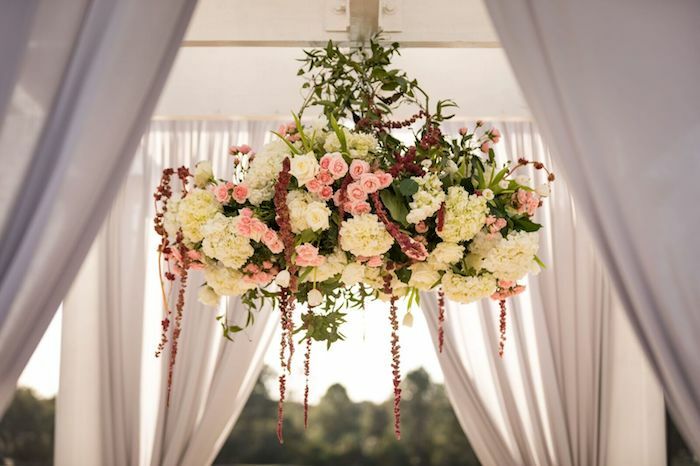 The aisle to the Wedding Gazebo was lined with large antique lanterns and touches of red and white flowers. The gazebo was draped in a soft grey, sheer fabric allowing the stunning floral chandelier to be a focal point behind the couple. 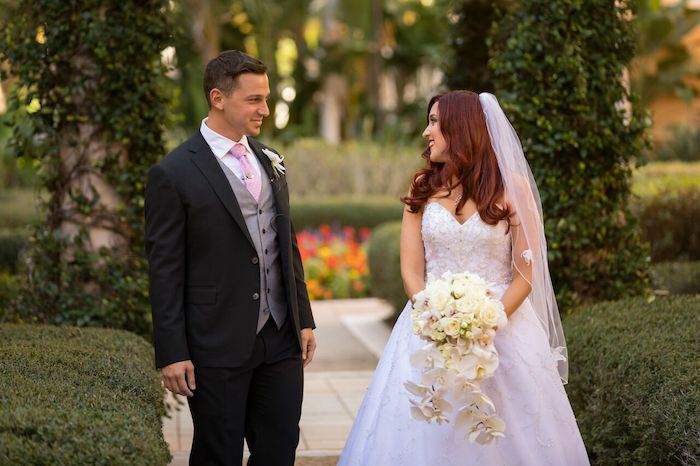 The Florida sunset behind their outdoor ceremony could not have created a more beautiful backdrop. Guests enjoyed a relaxing cocktail reception on the resort’s Tuscany Terrace. The ballroom was ready for an exciting reveal and was draped in twinkling lights on the ceiling. In the center was a communal head table that formed a square that seated nearly thirty people. 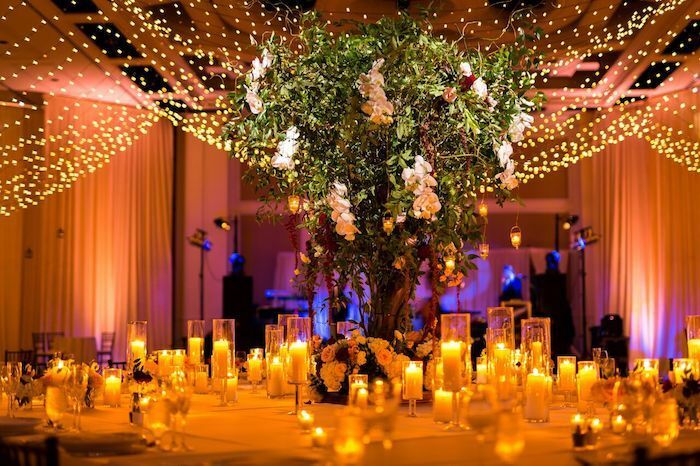 A tree with cascading orchids and over one hundred pillar candles filled the space in the center of the tables. The guest tables were set along the softly draped walls and also had trees in the center filled with flowers and flickering candles. A formal place setting with a gold rimmed charger and custom menu card in red lettering completed the tablescapes. Angela and David’s smooth, white butter cream, five-tiered wedding cake was adorned with cream, blush and pink roses that flowed down the cake and was set against a wall of lights. The band kept the dancefloor filled the entire evening and they enjoyed some sweet treats and fun snacks while they danced the night away. 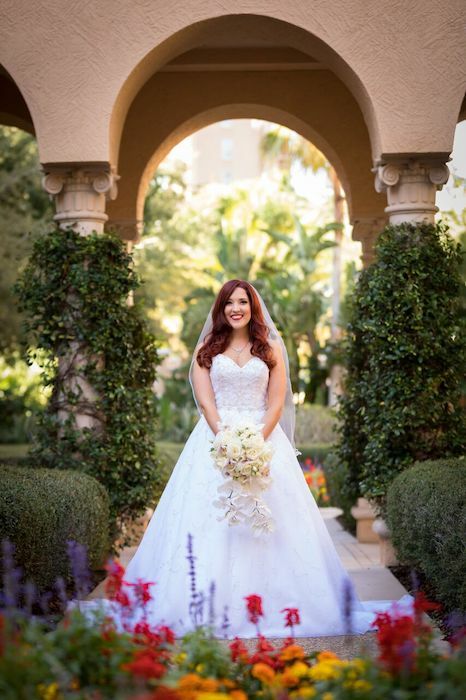 Thank you to all of the vendors who brought this fairytale wedding to life!